They produced two basic engines: a two-stroke 50cc and a four-stroke 126cc; both being produced due to necessity, which is the usual reason. The 50cc was designed as part of a manually carried and operated hedge cutter. The unusual feature of having the belt pulley central was for a variety of reasons. It provided the correct balance of the engine in the machine, it enabled an on/off clutch by tightening the belt and it enabled the use of an overhung crankshaft. It also widely spread the crankshaft bearings, a desirable factor. The overhung crankshaft enabled a case-hardened crankpin, the use of a needle roller big end and a lower standard of lubrication, a very necessary feature where farmers were concerned! The crankshaft was made in three parts: the main shaft, web (a stamping home-produced) and a high nickel case-hardened pin. The shaft was welded with the pin under water, thus retaining its hardness. The crankcase & cylinder, cylinder head and cover & cowling were pressure die-cast in high silicon aluminium alloy by an outside firm to our design. The manufacture of this engine was tooled up in a responsible way. For example: the cylinder & crankcase unit was mounted in a machine; all machining, boring, drilling, facing, etc being carried out completely automatically and simultaneously. An unskilled operator loaded and unloaded the casting, going in as a casting and coming out ready for building into an engine in about 30 seconds. When treated properly, these engines have an excellent life. 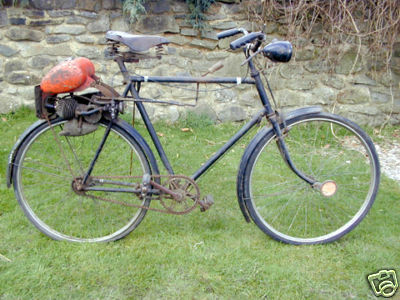 Production of the 2-stroke finished in about 1959. 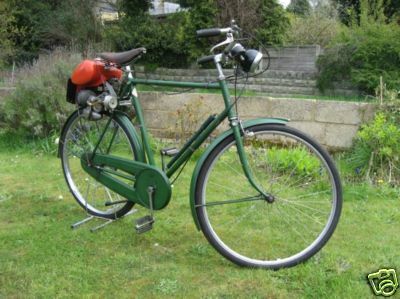 1955 Teagle Cyclemotor They were made in Cornwall, perhaps the only motorcycle ever to be made there, by an agricultural machinery manufacturer and used a chainsaw motor.